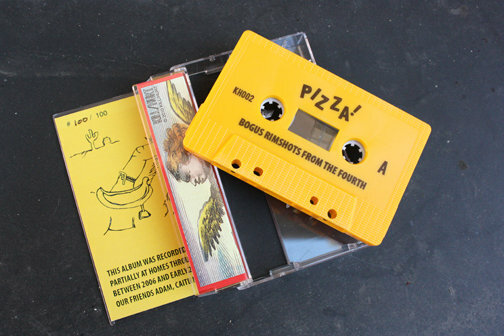 Known for percussion-heavy, tropical, punky, and literate synth-pop, Pizza! has drawn comparisons to most every important band from the canon of rock music, including new wave heroes like Devo, David Bowie, David Byrne and Sparks, as well as seemingly non sequitur influences including the Byrds, Beach Boys, Modest Mouse, and the Velvet Underground. 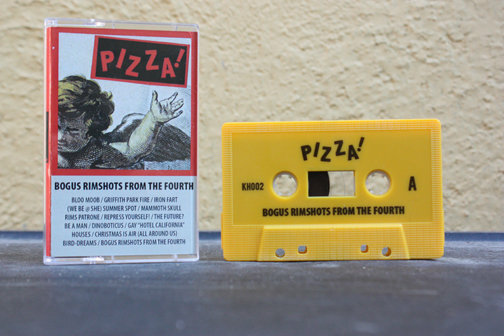 Bogus Rimshots from the Fourth compiles all of Pizza!’s early recordings and B-sides all onto a golden yellow C40 tape and features artwork designed by the band. Each tape is hand-numbered and limited to 100 copies and includes a free digital download of the album. Browse the Release archive. This entry was posted in PIZZA!, TAPES.